1. Mix flour sugar and salt in food processor. Pulse to blend. Then add cubed cold butter and pulse until mealy. Add water one TBSP at a time and pulse. Press together on parchment paper and split into two disks and refrigerate for 30 min. Once chilled take out and roll 1/8 inch thin, use pumpkin cutter to cut out 24 pieces. Put in fridge to chill. 1. In a bowl whip egg, cream cheese, sugar and flour until combined. Set to the side. come to room temp. Once cooled mix 1/2 cup pumpkin butter with 1/2 cup cheese mixture. 1. Mix sugar, paste and cream add milk one tbsp. at a time until the right consistency is achieved. Color 3/4 of glaze orange and 1/4 green. 1. Lay down 12 pumpkin pieces, brush with egg wash around the sides. Fill with 1 tsp of filling, lay a cake pop stick inside. Place a pumpkin dough shape on top and press the sides to seal. Cut a small slit in the top dough for steam. Put in fridge until chilled again. 2. Bake pops at 375 degrees Fahrenheit (190 degrees Celsius) for 15-17 min. 3. Let pops come to room temp then pour glaze on top to look like pumpkins. 1. Set oven for 410F/210C. Put butter, sugar, salt, oil and water in a large glass bowl and place in oven for 15-20 min until butter begins to brown. 2. All at once add the flour quickly and stir with a wooden spoon. Until a ball forms. Spray tart pan with PAM. Use small cookie scope to scoop balls of dough into each tart. Press the sides with a fork and poke holes in the bottom. 3. Put tart pan in fridge to chill for 5 min. 4. Bake for 7-9 min. 1. Remove stems and cut figs into small chunks. Place in a pot with honey and water. On med/ high heat simmer until it gets thick. Add lemon juice and cook for an additional min. let it cool in fridge. 2. Put mixture into a piping bag fitted with a star tip. 3. All ingredients to mixer and whip until fluffy. 1. 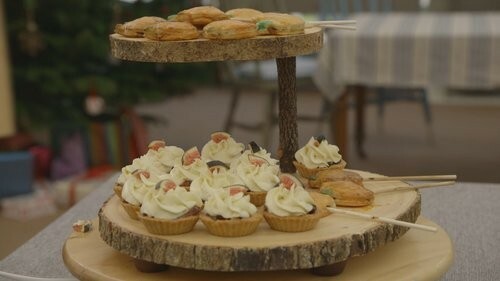 Cool tarts and pop out. 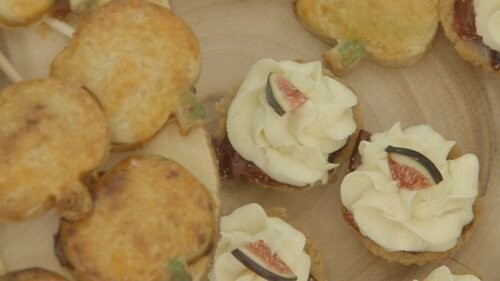 Fill with fig mixture, top with mascarpone crème and a chopped fig brushed with honey.